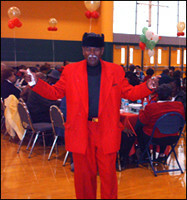 Holiday Season of 2007 - The Sunnyside Community Center Senior Gala | Piping Technology & Products, Inc. 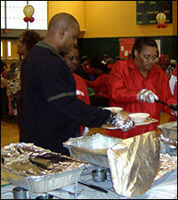 Piping Technology & Products, Inc. employees helped serve lunch to over 100 seniors at the 7th Annual Senior Christmas Gala and Birthday Celebration at the Sunnyside Community Center. 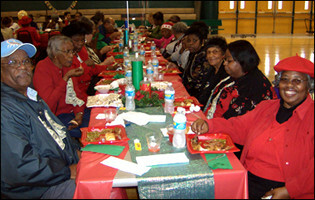 The seniors enjoyed an afternoon of dining on BBQ, provided by PT&P, complete with Christmas music and games. 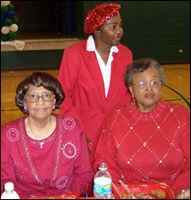 A number of seniors celebrated their birthdays at the event as well. The community center provides a variety of activities for the seniors including organized fitness, crafts, hobbies, and games. Piping Technology & Products, Inc. also donated a variety of basic necessities to the center including hygiene products, food and clothing. These items were distributed throughout the community and given to over 140 families in need. 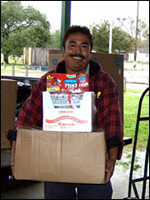 PT&P also held their annual donation drive at the company, and employees donated canned food and clothing. 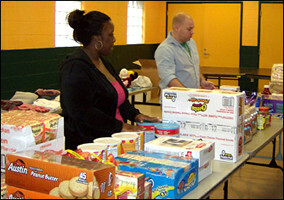 Below, PT&P employees help to unload the items at the Sunnyside Community Center.